It’s a fact that hybrid technology is expensive. Would many people be willing to pay for it? The Lexus RX400h is successful, but the Lexus GS450h is not. Maybe because of this, Peugeot has chosen to give its hybrid 508 some sport-ute flavor. The 508 hybrid won’t be available as a sedan. 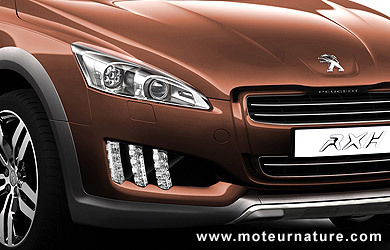 It will only come as a station-wagon, and it will be different from the standard 508 wagon. It’s a paradox, the 508 hybrid will have a bit of an off-roader look. You expect an hybrid car to ride low to the ground, for better aerodynamics, with low-resistance tires, you’ll get exactly the opposite in the 508 hybrid, which will get a raised suspension. So I can only guess that it won’t be as fuel-efficient as it could have been. 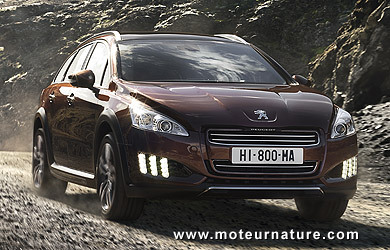 But Peugeot thinks its car would be more successful this way, with that go-anywhere look. Surprisingly, the French brand hasn’t used its Hybrid4 moniker for its hybrid 508. The car will use the RXH name instead. Like the Lexus, but that shouldn’t confuse anyone, Peugeot cars are very different from those of Lexus. More important, this Peugeot will have only 2 competitors in Europe (I don’t expect it to be available anywhere else), the Subaru Outback and the Audi Allroad. That matters, because Audi and Peugeot were quite equal 30 years, but the German brand has moved upmarket since then. 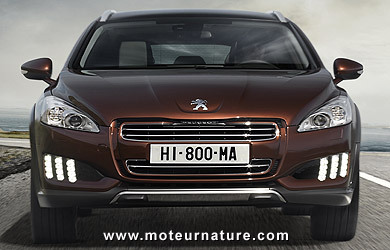 So I hope this hybrid 508 will help the French brand regain some lost ground. To that end, it will come with a very lavish level of equipement. The 508 RXH will be the most expensive 508, and it will come with such niceties as leather seats, a panoramic glass roof, a head-up display and a big screen sat-nav. The most important to me could be under the hood, but it’s not because the Hybrid4 architecture doesn’t change anything on the front end. This RXH starts as a normal front-wheel drive 2-liter turbo-diesel 508, with the hybrid system adding a little electric motor to the rear wheels. This makes the car a four-wheel drive vehicle, which can be “blocked” on an electric-only mode. The car is RWD then, but that doesn’t last. You can only make 4-km on the battery, and those will be low-speed only. Yet, Peugeot will be proud to tell that its hybrid system can do better than a Prius, which can only make 2-km on its battery. But as in all hybrids, it’s better to get the engine and the motor work together. The diesel makes 163-hp, and the electric motor adds 37 to give a combined 200-hp. The 332-lb-ft of torque is probably more impressive, but not as much as the fuel economy. Bystanders will notice the unique LED front lights, but the driver will give more importance to the fantastic 56-mpg rating. That’s an incredibly low value for a car that offers the same room, performance and versatility as a Subaru Outback. Families will also appreciate the 800-miles range, with the added bonus of diesel fuel, which is less expensive than gasoline in most of Europe. 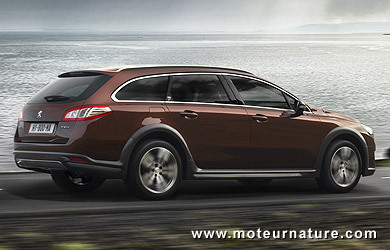 The Peugeot 508 RXH will be unveiled at the Frankfurt motor show in September, and it will be available next Spring. I expect its price to match one of a base, low-spec, BMW 5-series wagon, and that sounds like a nice proposition to me.